A kalimba, also known as a thumb piano or marimbula, is a percussion instrument found in African and other musical traditions. The sound of a kalimba is made by plucking the instrument's small metal tongues with a thumbnail. Serious kalimba players grow their thumbnails particularly long specifically for this purpose. 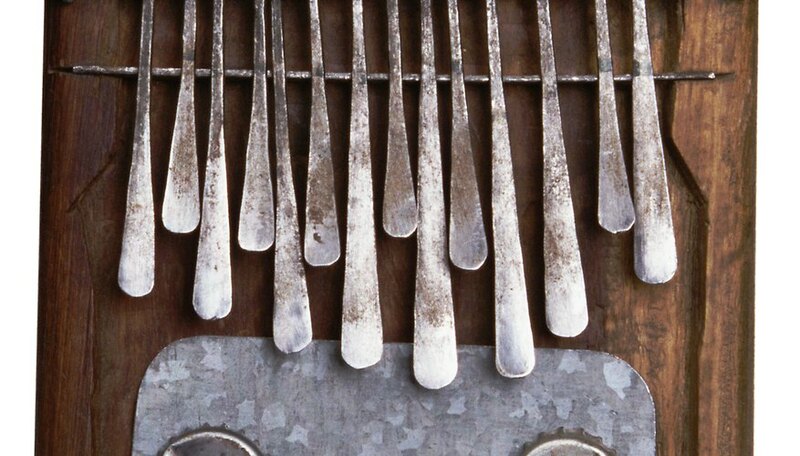 The metal tongues are attached to the body of the kalimba, which may be made of solid or hollow wood or a coconut shell. You can tune the metal tongues to different pitches by adjusting the length of metal that is free to resonate. Decide the tuning scale you would like to use for your seven-key kalimba. Many kalimba players tune to a diatonic scale, equivalent to the white keys on a piano. For a seven-note diatonic kalimba scale in C major, your pitches would be C, D, E, F, G, A and B. Other options include pentatonic scales (the black keys on a piano) or modes such as Aeolian or Dorian. Play your chosen series of pitches on your pitch source. This could be a piano, an electronic tuner or any instrument that is in tune at concert pitch. If it is within your vocal range, sing the series of pitches to internalize them in your mind and ears. Start by tuning the lowest key on your kalimba. This will be the longest or broadest metal tongue on the instrument. First play the pitch on your pitch source, sing the same pitch and then pluck the kalimba key. Work out whether the kalimba key is higher or lower in pitch than the desired note from your pitch source. If the kalimba key is higher than the desired pitch, make it lower by firmly grasping the end of the key that is furthest from the perpendicular bar holding the kalimba keys in place. Pull the kalimba key away from that perpendicular bar, so the piece of metal that is free to resonate is longer. If the kalimba key pitch is higher than the desired pitch from your pitch source, use a hammer to gently tap the end of the kalimba key back toward the perpendicular bar. This will reduce the amount of resonating metal in that key and raise the pitch. If the kalimba key is stuck or will not move when you grasp and pull it, use pliers to move the individual key, or to loosen the perpendicular bar. Repeat the tuning process for the other six kalimba keys. Once all of the keys are in tune with your scale or mode, play them in order from lowest to highest pitch to double-check the tuning against the series of pitches.